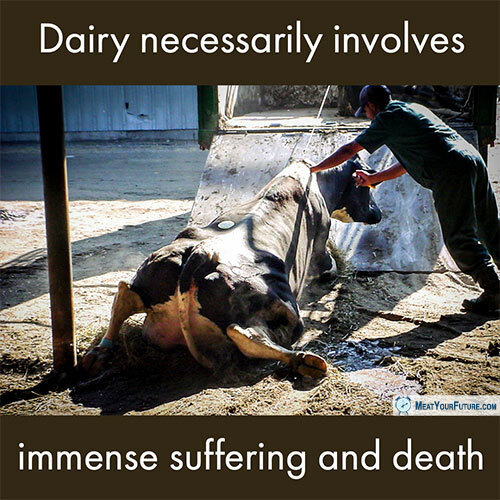 Cruelty is unavoidable in dairy production. This image shows what is sometimes referred to as “spent cow” or a “downer.” She can no longer support herself, after a short life of repeated impregnations and overmilking. Female cows in the dairy industry are impregnated, over and over, to get them lactating. Their resulting calves are taken away, usually right away, which causes severe distress for both the mother and calf. And once her body begins to break-down and she can no longer produce milk profitably, she is sent to slaughter. It is truly a life of torture and misery, simply because we want the maternal lactations of a different species – something that is completely unnecessary (indeed unhealthy) for us to consume. Dairy farmers who see our posts sometimes tell us, at “their” farm the cows are “happy” and there’s nothing wrong with what is done to them. Even if the farmers are genuinely doing their best to treat their “animal property” well, there is simply no way around the inherent cruelty that is involved. No matter how organic, pasture-raised, or humane-washed the label, unless you have a “magical” cow, the females must be impregnated to produce milk and the resulting calves are either (1) killed immediately if not needed (including the males who will never produce milk); (2) kept alive for a short period to be sold/killed for veal; (3) kept alive a little longer, 12 to 18 months, to be sold/killed for beef; or (4) if female and not surplus, used as the “next generation” to be impregnated, separated from her calves, milked until her production declines, and then killed. Diary contains hormones that cows produce naturally, even if labeled “no hormones added”. It’s designed to grow calves very rapidly. It’s not for humans. Fortunately, with so many wonderful, healthier and delicious plant-based alternatives, it’s never been easier to completely ditch dairy (and, indeed, all animal products).